The Jaw In-Shear Coupling (pictured right) is a straight forward 4 piece non-fail safe design (meaning the coupling will no longer transmit torque if/after the elastomeric element fails) that is optimized for quick elastomeric element replacement (with neither jaw coupling hub being required to be moved). Because the coupling is non-fail safe, the coupling behaves similar to a non-calibrated fuse to prevent equipment damage in the event of torque overloads. 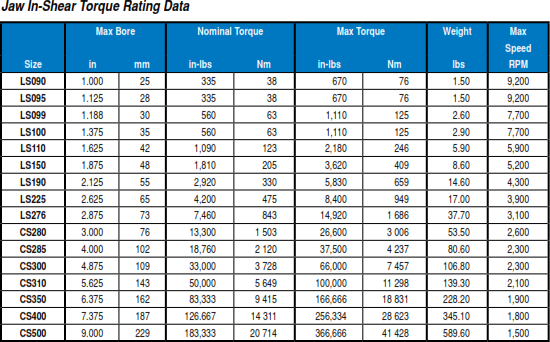 (Note: Elastomers are not rated or designed to fail at a specific torque level, so other methods such as rated shear pins or torque limiters should be used if a true fuse is required.) Instead of the spider being compressed between interlocked jaws of each coupling hub (a traditional jaw coupling configuration), the Jaw In-Shear coupling has the hubs drawn apart with jaws aligned axially. The wide spider is thus in a shear-plane. Jaw In-Shear elastomeric spiders, being radially removable, results in saved maintenance time and money. 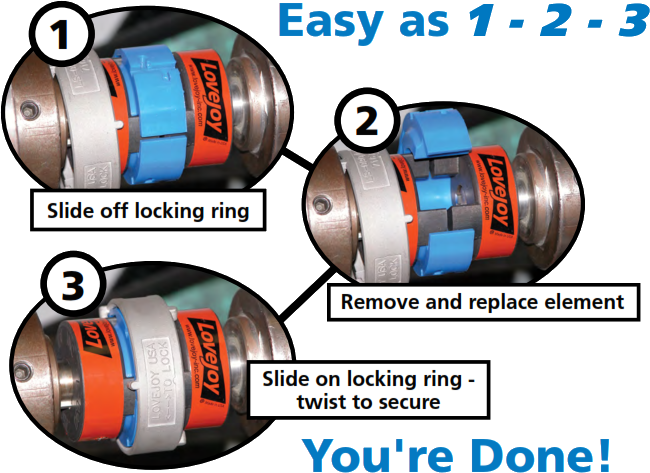 The coupling's retaining ring encloses and secures the In-Shear Spider, using an intuitive twist-lock design that will not work loose and requires no fasteners. 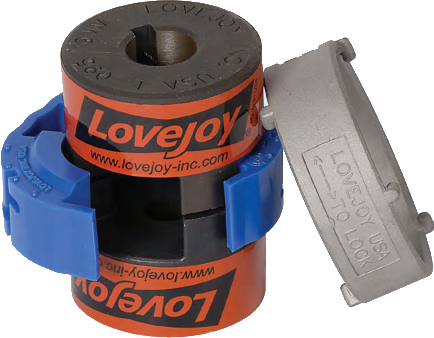 Furthermore, the Jaw In-Shear uses Lovejoy's industry-standard L-Type and C-Type jaw coupling hubs which are both cost effective, and quite possibly already installed on the equipment (meaning a retrofit cost will be reduced to the Jaw In-Shear elastomeric spider and retaining ring. The Jaw In-Shear spider is made from a tough Urethane formula offering high durability, chemical resistance, temperature range, and torsional softness. Jaw In-Shear coupling designs are available for jaw coupling hubs with max bores up to 9.0 inches (229 mm) and 183,333 in-lbs (20,714 Nm). 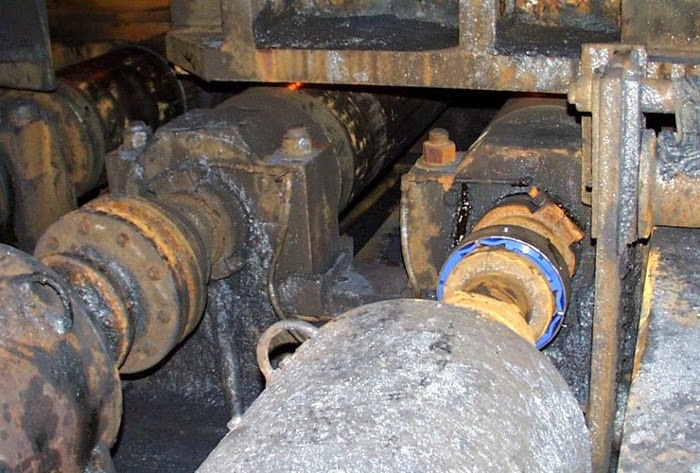 Common applications for Jaw In-Shear couplings include rolling mills (pictured at right), electric motors to centrifugal pumps, fans, blowers, gear boxes, and plastic extruding machinery. The Jaw In-Shear solves many maintenance problems and creates on-going savings & environmental risk reduction opportunities in industries like pulp & paper, petrochemical, mining and steel.